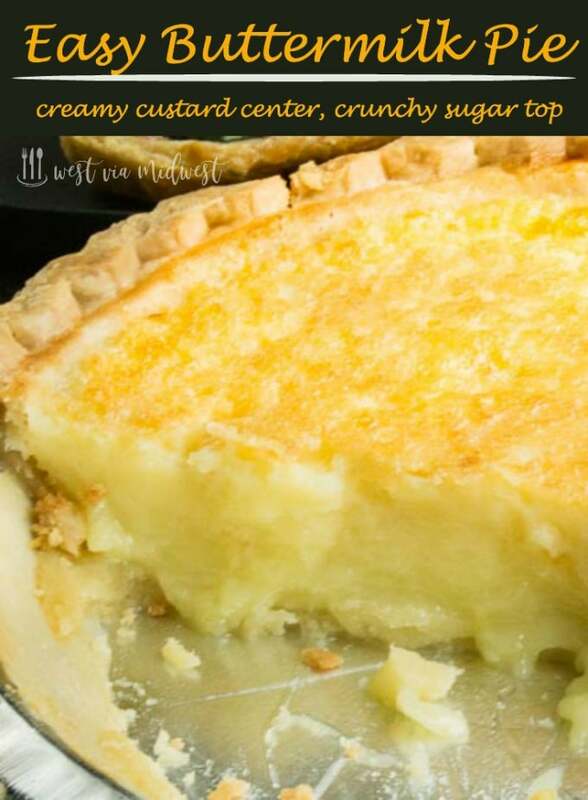 An Easy Buttermilk Pie recipe that yields a sweet pudding like custard center like a chess pie with a crunchy top like creme brûlée in every bite! Today is Pi Day! (3.14) so Im sharing an Easy Buttermilk Pie Recipe with you. Ive gotten together with some of my other food writers who are also posting about pie today so you can be completely covered in any flavor of pie your heart may desire! What is Pi Day? Pi is the ratio of a circle’s circumference to its diameter. Pi is a constant number, meaning that for all circles of any size, Pi will be the same. The actual number of Pi is 3.14 and then a ton of other numbers, thus why its celebrated on 3/14. In the food world we’ve taken it to share any and all pies on this day! Isnt that so much more fun than the mathematics of Pi Day? My husband and I were in Minnesotta last fall and this adorable diner called the Barn in Brainerd MN. It had both the famous maid-rite sandwiches and 9 selections of pie on the menu. One of their pies the day we were there was Buttermilk Pie. I’d never heard of it, but they said it was their most popular pie so we gave it a try. It was heavenly. A beautiful custard center that was sweet, but the lemon in it made it balanced. The top was almost crunchy. The sugar in the pie caramelized when baking so it was like a creme brûlée on the top. We devoured it and knew exactly why it was their most popular pie. When I came home I found a buttermilk pie recipe in my Grandma Hyde’s recipe book. I dont ever remember her making this pie, but she did live in the south so Im sure thats when she made it. It’s so easy to make you can have it ready in 10 mins to go into the oven. What is a buttermilk pie? 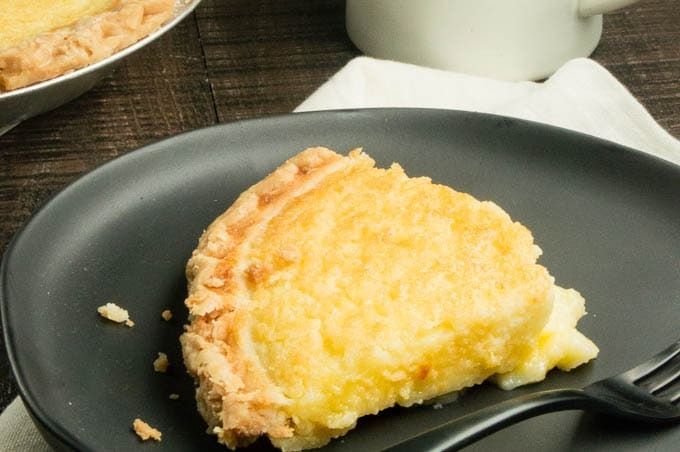 A buttermilk pie has origins in England, but typically today it is known as a southern recipe. It has a custard center and is made with just a few ingredients. Buttermilk gives the pie a unique tart like taste that balances out the sugar in the pie. Are a Chess Pie and a Buttermilk Pie the same thing? 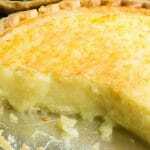 Tips for making this Easy Buttermilk Pie Recipe? Bring to room temperature the butter and eggs so its easy to cream. Do the pie in steps, first mix the eggs until frothy. Add the butter, sugar and flour and mix until fluffy. Add the rest of ingredients and make sure the filling is smooth. Can making a pie be any easier? PIN THIS TO YOUR PIE BOARD OR EASY DESSERT RECIPES FOR ENTERTAINING BOARD so you can find it easily when you need it. Be sure and check out these other #PiDay recipes from my food writer friends! An Easy Buttermilk Pie recipe that yields a sweet pudding like custard with a crunchy top like creme brûlée in every bite! In an eclectic mixing bowl, mix eggs until super frothy and bubbly. Add butter, flour and sugar and beat for 2-3 minutes until well combined and fluffy. Add buttermilk, lemon juice, vanilla and nutmeg until very smooth. Pour into the 9 inch pie tin. Bake for 40-50 minutes until a knife comes out clean when inserted in the center. Allow to cool completely (1 hour) before cutting. If making ahead for use later or another day, allow to come to room temperature (3-4 hours.). Then place in the fridge, covered until ready to use. Pie is good for 2-3 days. At one time did your Grandma Hyde live in Marietta, Ga.? Funny cause I shared a chess pie for Pi Day! I actually don’t think I’ve ever had a butttermilk pie and now want to fix that. I never heard of buttermilk pie. I like the sound of that sugar crust. I’m always looking for recipes to use buttermilk in. Can’t wait to try this! Yum, I love the ingredients in your buttermilk pie. Buttermilk is so flavorful and your pie looks so creamy and delicious! How fun that you found the recipe in your grandma’s cookbook after falling in love. If there are two entities that know their pies, it’s grandmas and diners so you know this has to be amazing! 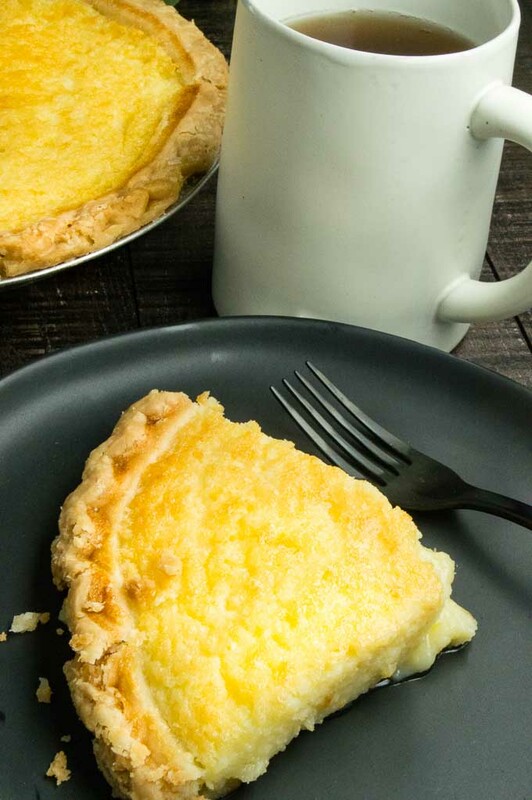 I have never heard of buttermilk pie, and now I need to try one. Beautiful! This pie sounds WONDERFUL. I just love a creamy, custard filling and the texture on top definitely has me sold. Loved reading the distinction between chess pie and buttermilk pie and can’t wait to click through and see some of these other pie ideas! I love Buttermilk Pie but I’ve never made one. Your recipe and tips make it sound a lot easier than I thought it would be! I can’t wait to try this! My father-in-law loves Buttermilk Pie! I’m going to have to make your recipe for him sometime soon – maybe Father’s Day! I haven’t made buttermilk pie in year. It was one of my Mom’s favorite pies. Yours looks cream and delicious! I too, love the crunch on top. You were reading my mind about the difference between a buttermilk pie and a chess pie. Thanks for the education…and the recipe. Can you believe I’ve never baked nor even tasted this pie! It looks dreamy! I know my custard loving husband would approve! I’m not sure if I’ve had this before but I think I’m going to have to try either way, looks tasty.